This is Part 2 of our Mars Needs Surveyors series from the Pangaea newsletter. Part 1 is here. As the dream of Mars colonization comes to fruition, what would surveyors be tasked with? Habitat construction SpaceX’s Elon Musk’s vision is to build a city on Mars (appropriately named SpaceX City) that would eventually be inhabited by one million “Martians.” Lots of construction surveying needed would be here. And forget all those “artists’ conception” dome-covered cities you’ve seen; the best and safest place for humans is underground. Water. As a necessary component of human life, obtaining water would obviously be a high priority. There are several sources of water on Mars. Tapping into fresh water from the north polar ice or its many glaciers is the most feasible and would require extensive geophysical surveys and surveying for pipeline placement and construction. Mining. This is how many believe a Mars colony could sustain itself and would provide ample work for Martian surveyors. For starters, Mars has five times the amount of the nuclear fuel, deuterium, than Earth. This will come in handy as many think nuclear power would be the most effective energy source for the red planet. To give you an idea of just how powerful deuterium is: one milliliter (0.0339 liquid ounces) of deuterium has the energy equivalent of 20 tons of coal—and there’s no coal on Mars. Given its energy density and the lack of deuterium on Earth, it looks like this could be a valuable export as well. Then there are precious metals like gold and palladium which are suspected—thanks to Mars’ low gravity, 62% of Earth’s—to be closer to the surface and thus easier to mine. Exporting these precious metals to Earth would also be easier thanks to the planet’s lower escape velocity. Additionally, thanks to its proximity to the asteroid belt and its low gravity, Mars will make an excellent base for asteroid mining. We talked about asteroid mining in an earlier issue of Pangaea. An excerpt from that issue: “Quoting from ‘Asteroid Mining 101’: ‘The near Earth asteroid (NEA) population could support approximately 400 billion people at a generous level of affluence from now until the Sun enters the red giant phase several billion years from now.’ What about the resources of the main asteroid belt? Dr. Lewis puts the available resources of the main asteroid belt (near Mars) at 100,000 times the NEA number.” With mind-blowing stats like these, it’s easy to see how Mars could be the main starting point for the next gold rush. 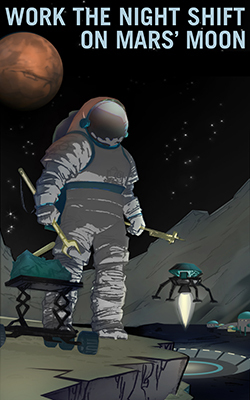 “Gold rush” seems too tame a description for the mind-boggling opportunities that main belt asteroid mining promises. Spaceport Mars. Asteroid mining would not only be a wildly lucrative industry for Mars, but it also could help it become a spaceport. Metal harvested from asteroids can be used to build spacecraft that can then be fueled with Mar’s methane for further exploration and colonization into the solar system and beyond. Mars will take Musk’s “space-faring/multi-planetary species” concept to the next level. From Mars to the stars! What I love about the thought of surveying on mars (as in spatial science) is that there is no existing gnss system, it would be all old school measurments but with the added advantage of being able to set up a global survey reference system from the start. Tracking where all global assets are from from an MCMF (mars centred mars fixed Elipsoid reference system, totaly taken from ECEF).